McClintock discusses implications of Larsen C ice shelf collapse. 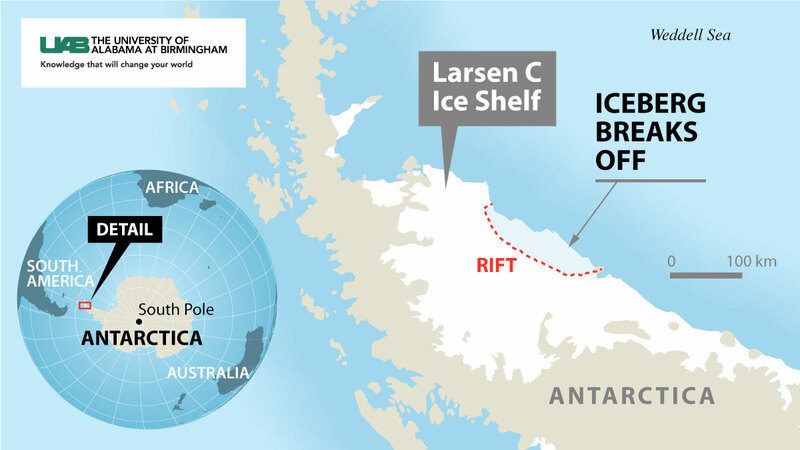 University of Alabama at Birmingham polar biologist and Antarctic explorer, Jim McClintock, Ph.D., provided advance insight into the Larsen C ice shelf break that occurred sometime between Monday, July 10 and Wednesday, July 12. This ice shelf break, which encompasses a 5,800 square kilometer, one-trillion ton section of Larsen C in Antarctica, is one of the biggest iceberg breaks ever recorded in history. Its volume is more than twice that of Lake Erie. McClintock offers a unique perspective on this monumental event, as he speaks to the incredible effects that Antarctica’s extremely diverse ecosystem will experience, and ultimately how this break will impact global ecology. In short— what does this mean for the rest of the world? This video is available for you to download, along with additional raw interview footage, if you are interested in seeing more. We can arrange phone interviews beginning today, July 12. Live or taped HD interviews are available with Dr. McClintock via our news studio through LTN Global Networks beginning July 13 around 4 p.m. Central time. On Friday, July 14 at 10 a.m. Central time, UAB will host a Facebook Live Q&A session with Dr. McClintock at www.facebook.com/UAB.edu/. Please let me know if you have any interest in the video footage for your use, or if you would like to arrange an interview with Dr. McClintock. I would be happy to assist.